Cockroaches are a common pest in Australia, which can be controlled but certainly not completely eradicated. There are several species of cockroach, and they are pests primarily because of contamination of food from their droppings and the spread of diseases such as Salmonella, Diarrhea and Typhus. A common perception of cockroaches is that they are ‘clean’ insects and have impeccable grooming habits. This is true only if you consider roaming sewers, garbage and compost heaps as clean habits! Cockroaches are nocturnal insects, hiding in cracks and crevices by day. They even hide inside electrical equipment in search of warmth, and can cause expensive damage this way. 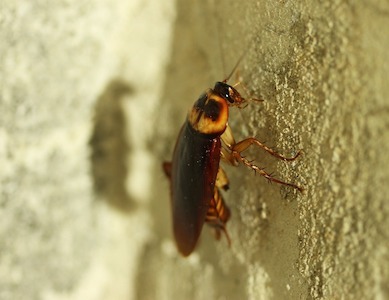 Controlling cockroach infestations is best achieved through a regular treatment of your premises.